I ‘ve found that not everyone is interested in learning new things; in fact, many people don’t even like thinking about learning new things. And then there are others who are so interested in learning that nothing will stop them. 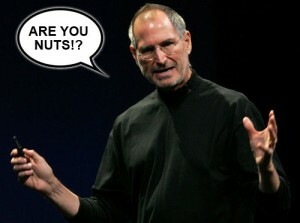 And so of course enters Steve Jobs. I never thought much about Jobs until one day while gazing lovingly at my iPhone did I realize how amazing it was. I also reminded myself that nothing in front of me should ever be taken for granted because it means something to my life. Job’s theory was to keep you eye on what fuels you and believe what you are doing is connected to your future. “When you do what you love, the dots will eventually connect,” said Jobs. This is real customer service. Jobs and I also shared the path of cancer, my path like his has been twice but I am still here. I know what it means to have the doctor tell you how long you have to live and then wondering how could she be talking to you since you don’t even feel sick. I understand the urgency of life and following your dreams. Cancer has a way of telling you to pay attention to your life. It has a way of telling you to hurry up and get on with it no matter how the rest of the world or the people in your life feel. I recently watched Job’s graduation speech at Stanford in 2005 as he recounts his brush with death and how it impacted his life. “If it doesn’t feel like something you want to do then don’t do it” was the essence after his first brush with death. Jobs lived his life that way, believing that his path had a purpose and that it would lead him somewhere. His insights into life and his path to greatness leaves many of us in awe–as it should. Everything in your life has been put in front of you for a reason. I believe it’s up to you to determine the reason and proceed as if it all matters. On some level, conscious or unconscious, it does. It may be hard to realize that looking at death can move you forward since we often think that only good things can move us forward. If you believe in yourself, it’s all good and everything can move your forward. Jobs dropped out of college because he hated the classes but promised his adopted parents he would give it a try. You see his birth mother was unwilling to give him up unless his adopted parents agreed to give Steve a college education. Despite the fact they were uneducated (they lied to get Steve) they gave up everything to get Steve educated.) After dropping out of college he was free to live his life and take any classes that interested him. His choice was calligraphy. He didn’t know why but he thought it was beautiful, little did he know it was to be a major part of the Mac he later designed. If you’re not doing what you want right now, at one point in your life, if you’re lucky, you will decide to do what you really love. One day your wake up call will be ringing in your ears; don’t hit the snooze button. I always knew I loved sports, I majored in physical education and never did anything formal with it but feel at my best when I’m at the gym. I’m lucky I’ve at least connected those dots. Follow your heart and your path; not your mom’s, your wife/husband/boss’s path but the one that gives you “juice.” I was discussing this with one of my business friends who said he liked the term “juice.” I’m sure I didn’t make it up but it sure fits. If what you do makes your mouth water, you’re on the right track! Live your life as if you “are” and remember you are exactly where you need to be at this point and you’re doing the right thing. There’s a reason for it and a way for you to grow–if you believe in yourself. The mistake we make is in the belief that when something bad happens it becomes a stumbling block to our life. Consider that whatever it is it has a purpose. Maybe it’s to slow you down and so you can practice your “problem solving skills” or to take another path. As Steve Jobs said, if you’re doing what you want the dots will connect themselves and eventually you will know what it all means. Ah, the adventure of life.